Eunice Johnson was an entrepreneur and visionary whose dedication to promoting and celebrating positive Black images led her to create some of Black America's most enduring enterprises. With her husband, she began Ebony Magazine in 1945. Many years later she created Fashion Fair Cosmetics the first department store makeup for African-American women. Ms. Johnson's crowning achievement, however, was the creation of the Ebony Fashion Fair in 1958. 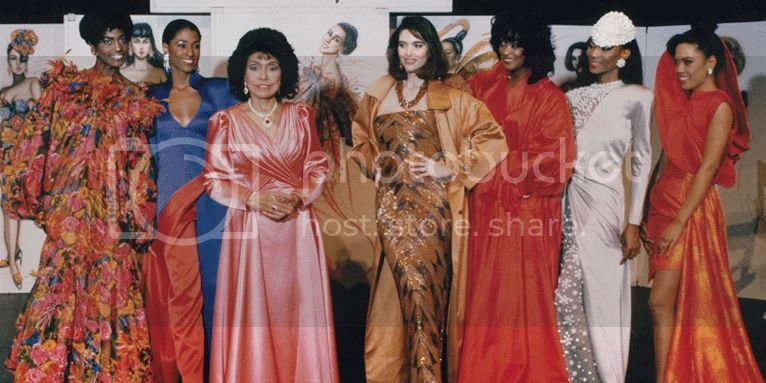 Ebony Fashion Fair provided an outlet for Black beauty and creativity- launching the careers of countless models and designers who never would have been highlighted by the mainstream. But the show was more than extravagant gowns. Over the years it has raised more than $55 million for charitable causes. It's a shame that five decades after Ms. Johnson brought Black glamour to the masses we still get giddy upon seeing Halle Berry on the cover of American Vogue or Chanel Iman on Paris Couture runways. It was Ms. Johnson, after all, who convinced Rudolph Valentino to use Black models in the 60s. There is still progress to be made. Just days after her death in January of 2010, Mrs. Johnson was honored with a celebratory luncheon at New York City's Metropolitan Museum of Art. Guests included Former President Bill Clinton, Whoopi Goldberg, and current CEO of Johnson Publishing Desiree Rogers. Black elegance is ubiquitous. It is boundless. And in elevating images of us, Eunice Johnson left an indelible mark on our consciousness. We honor you, Mrs. Johnson. Black Women Who Changed History honors the contributions Black women across The Diaspora have made to the world. Each day in February we will feature a different woman and her achievements. The column will be weekly hereafter. Don't miss any of our featured women. Subscribe, Like, and Follow For Harriet today!